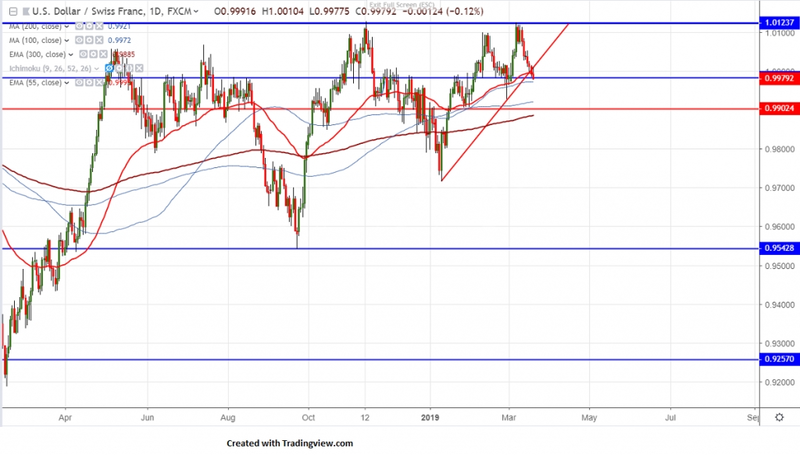 USDCHF continues to trade lower for past one week and hits 2-week low around 0.99785.The pair has formed temporary top around 1.01242 on Mar 7th 2019. Markets eyes US Fed and SNB monetary policy for further direction. Both Fed and Swiss National Bank are expected to more dovish and Swiss economy got contracted as their main export market slowing. A stronger Swiss franc will make nation’s export less attractive. It is currently trading around 0.99785. On the higher side, near term resistance is around 1.0030 and any violation above targets 1.0060/1.010/1.01285. Any break above 1.01285 confirms that bear trend has stopped around 0.97162 and jump till 1.0175/1.0340 is possible. The near term support is around 0.9985 (50- day MA) and any break below will take the pair to next level till 0.9919 (200- day MA)/0.9850. It is good to sell on rallies around 1.000 with SL around 1.0030 for the TP of 0.9920.